The Portafold caravan was originally designed in 1960 by Brian James, Ron Nugent and approximately four others for their company Portaplas Ltd. based at Emsworth, Hants. Portaplas was set up specifically to manufacture the Portafold, after the company producing a smaller two berth folding caravan, called the Mini-Motel, decided they were not prepared to meet the demand for a larger caravan by designing and manufacturing a completely new four berth version. 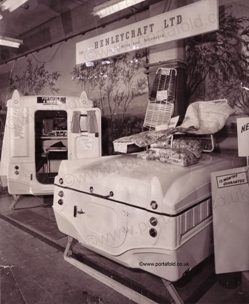 In 1961 the new company (Henleycraft Ltd.) that Brian, together with Eddie Elliott, had created to handle the sales and marketing of the Portafold, started advertising the newly designed caravan at shows such as the Ideal Home Exhibition and the Camping & Outdoor Life Exhibition, both held at Olympia in London. From 1966 the caravan was built under licence by Plastics (Fareham) Ltd. at The Yard, Broadcut, Fareham, Hampshire. The two owners, Conrad Faulkner and Lionel Abbs, started working together restoring old buses and army trucks before moving into the glass fibre business. Plastics Ltd. produced all manor of glass fibre products but they specialised in making fishponds, boats and boat parts. Conrad continued to run his business 'Faulkner's Transport Ltd.' and left the running of Plastics Ltd. to Lionel, May Snell and the sales manager Mike O'Neill. Following the death of Conrad in around 1971, a new company called ANS Mouldings Ltd. was set up by Lionel and May. Although Lionel wasn't listed as a director of the company May's husband Brian Snell and their son, also called Brian, were. The name ANS Mouldings Ltd. came simply from the names of the owners, Abbs ‘n’ Snell. The new company shared the same building that Plastics Ltd. were in but ANS occupied the loft space whilst Plastics Ltd. remained downstairs. The building they shared was used from the early 1900’s as the local tannery and currently houses two companies called Airport Bodyshop and Precision Engineering. The last Portafold was made in 1976, and following a rename to Ansfold, and a restyling to make them more conducive of the 1970's, the first Ansfold rolled out of the factory in the same year. ANS took on the manufacturing of the roof and the sides of the new Ansfold, and Plastics Ltd. continued to manufacture the base of the caravan and handle all of the assembly. Production of the Ansfold finally ended in 1980 due to market saturation and the increased competition of other folding caravan manufacturers, such as Rapide, from mainland Europe. 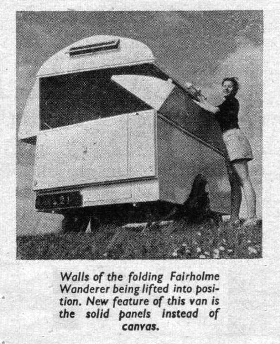 The Fairholme Wanderer - Is this where the idea for the Mini-Motel and the Portafold came from?